A few years ago my wife and I took our young children into Paris to view the tourist sites. We were staying outside Paris, at La Houssaye-en-Brie, and got the train in on what was a blisteringly hot day. By the time we emerged from the busy metro around lunchtime, agitated and sweating (No! Men perspire, women glow, only horses sweat!) we looked for somewhere to eat. I don’t recall where we were exactly, possibly Les Halles, but there was no shortage of cafés, yet to my shame we espied the golden arches of regret and thus my offsprings first repast in the City of Love was a Royale with fries. In reality we were experiencing the paradox of choice, the abundance of which was attenuating our already stressed state. If the American Empire can be said to have contributed anything to human civilisation, it will be consistency and predictability, and so our agitation was assuaged by several thousand calories worth of lard. When reading the arguments for eliminating brett, one seems pre-eminent, As Randall Grahm of California’s Bonny Doon put it: “The problem is that for now, this is not easily controllable”. It seems to me that the American need for consistency and predictability is strong – bottle to bottle, barrel to barrel, even vintage to vintage. The desire for consumers to see your bottle on the shelf and know what the “brand” represents, and what they can expect when they come to drink it. The McWine. Is that what we want though, at least when we get past the £6 bottle of Hardys? Here in blighty I suspect not. We’re the kind of consumer that will choose taster menus when we visit Michelin starred restaurants – in fact my favourite restaurant, Fraiche, doesn’t offer à la carte – and why not? We don’t dictate the set list when we go to a concert after all. Why not say to the chef “Surprise me!”, and why not say it to the vintner too! Which brings me back to Chateau Musar (again!). 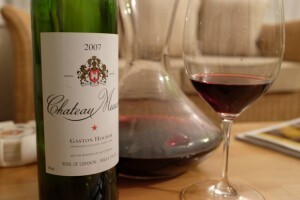 Last night I enjoyed a bottle of the 2007, the second of this vintage I have tried. It was as pleasurable as ever, concentrated with firm tannins, and yes, more brett and volatile acidity than some might like. But what makes me smile is the variation between vintages, this bottle is nothing like the smooth 1999, the light 2000 or the all rounder 2005. With Musar life really is like a box of chocolates, and I’m looking forward to taking my first bottle of 2008 out of the garage.